Rates from Brazil to China fall by $4/tonne, $6,000/day; queues at Dalrymple Bay to ease, return to normal in January. Freight rates for large dry cargo ships on key Asian routes could slide further from multi-week lows as chartering activity thins during the holiday season and abundant tonnage for January weighs on rates, brokers said. Capesize rates from Brazil to China have dropped by $4 per tonne in the last week, equivalent to a daily earnings fall of about $6,000. Port congestion in Australia and China which helped propel rates to three-year highs earlier this month is also expected to ease. Hold-ups at Hay Point and Dalrymple Bay, one of the world's largest coal export facilities and where at least one panamax bulk carrier waited more than six weeks to load, are set to clear. "It's business as usual off Hay Point but we're still seeing queues for Dalrymple. However it's declining steadily and we're expecting a return to normal sometime in January," Ian Macfarlane, chief executive of the Queensland Resources Council, told Reuters. The capesize charter rate on the Western Australia-China route fell to $8.54 a tonne on Wednesday, the lowest since Nov. 22, from $9.93 a week ago. It hit $9.98 per tonne on Dec. 12, the highest since April 2014. Freight rate from Brazil to China hit $17.50 a tonne, the lowest since Oct. 13, versus $20.36 the previous week. It hit $21.27 a tonne on Dec. 4, the highest since November 2014. 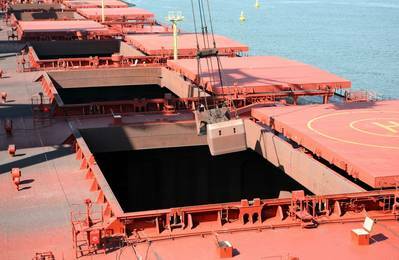 Some vessel operators are offering around $8.60 a tonne for Australian iron ore cargoes to load in early January, with around $17 per tonne for iron ore shipments from Brazil, a Singapore-based capesize broker said. "Owners are presently under-bidding each other in order to secure employment over the holidays," Norwegian ship broker Fearnley said in a note. "People think the market can pick up next week as the miners pick off ships, but I can't see it coming up. Everyone is winding down," the Singapore-based broker said. Rates for panamax ships for a north Pacific round trip voyage slipped to $10,814 per day on Wednesday, the lowest since Dec. 1, from $11,583 a week earlier, on a substantial reduction in chartering activity, Fearnley said. Rates in Asia for smaller supramax ships fell further falling to $6,000-$7,000 per day from Indonesia to China and Indonesia to west coast of India.